can range from CD's, molded and stamped parts, pharmaceutical, and cosmetic order fulfillment. This machine uses two Rolls of Cold Seal Material to make the protective pouch. Both webs of material come together and create a V-Shaped area in which to place products into. Custom Funnels and Guides can be supplied for the various product ranges. The Side Seals and Length Cutoff are done simultaneously in the sealing head of the system. 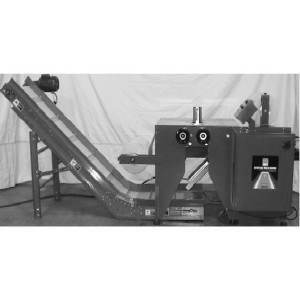 The machine uses pre set length adjustment to regulate the package size. Machine operation and setup are done through the touch screen controller. This allows the operator to make adjustments quickly and easily.